Burbank, Calif., August 5, 2014 – The Quest through Middle-earth continues inThe Hobbit: The Desolation of Smaug,from Academy Award®-winning filmmaker Peter Jackson[i], when the epic fantasy adventure is released as an Extended Edition on Blu-ray 3D and Blu-ray on November 4th from Warner Bros. Home Entertainment (WBHE). A production of New Line Cinema and Metro-Goldwyn-Mayer Pictures, this extended cut of the second film in The Hobbit Trilogy includes 25 minutes of extra film footage that extends individual scenes, making this the must-see, definitive version for fans. Both versions of the Extended Edition include more than nine hours of new bonus features that will enrich the experience of the Trilogy as fans gear up for the December 17 theatrical release of the third and final film, The Hobbit: The Battle of the Five Armies. Ian McKellen returns as Gandalf the Grey, with Martin Freeman in the central role of Bilbo Baggins, and Richard Armitage as Thorin Oakenshield. The international ensemble cast is led by Benedict Cumberbatch, Evangeline Lilly, Lee Pace, Luke Evans, Stephen Fry, Ken Stott, James Nesbitt and Orlando Bloom as Legolas. The film also stars Mikael Persbrandt, Sylvester McCoy, Aidan Turner, Dean O’Gorman, Graham McTavish, Adam Brown, Peter Hambleton, John Callen, Mark Hadlow, Jed Brophy, William Kircher, Stephen Hunter, Ryan Gage, John Bell, Manu Bennett and Lawrence Makoare. 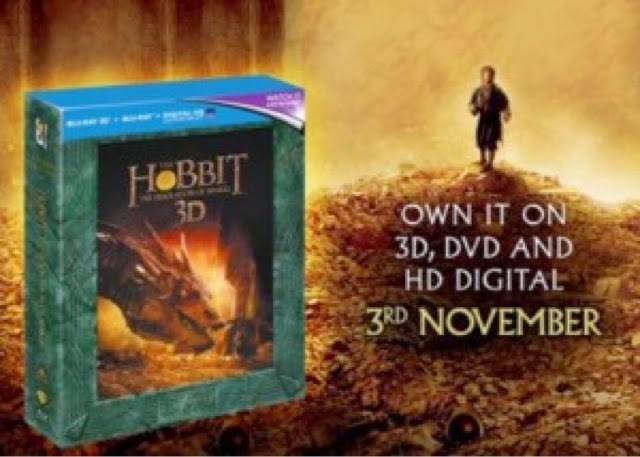 The Hobbit: The Desolation of SmaugExtended Edition will be available as a 5-disc Blu-ray 3D set ($54.98 SRP) that features the Blu-ray 3D and Blu-ray versions of the Extended Edition; and a 3-disc Blu-ray ($35.99). Both the Blu-ray 3D and Blu-ray include a digital version of the movie on Digital HD with UltraViolet. The nine-plus hours of new special features boasts audio commentary with Peter Jackson, the film's director/producer/screenwriter, and Philippa Boyens, co-producer/screenwriter, as well as “The Appendices,” a multi-part documentary focusing on various aspects of the film and the Trilogy. Complete special feature details are provided below. The Hobbit: The Desolation of Smaugcontinues the adventure of the title character Bilbo Baggins as he journeys with the Wizard Gandalf and thirteen Dwarves, led by Thorin Oakenshield, on an epic quest to reclaim the Lonely Mountainand the lost Dwarf Kingdom of Erebor. Having survived the beginning of their unexpected journey, the Company travels East, encountering along the way skin-changer Beorn and a swarm of giant Spiders in the treacherous forest ofMirkwood. After escaping capture by the dangerous Wood-elves, the Dwarves journey to Lake-town, and finally to the Lonely Mountain itself, where they must face the greatest danger of all–a creature more terrifying than any other; one which will test not only the depth of their courage but the limits of their friendship and the wisdom of the journey itself–The Dragon Smaug. · The Appendices – The Appendices Parts IX and Xshowcase an immersive multi-part history of the filming of The Hobbit: The Desolation of Smaug, covering pre-production in the various departments of the film in the months leading up to the start of principal photography, training, the work done on set and in the world of its digital effects. Beginning late October, The Hobbit: The Desolation of Smaug Extended Editionwill be available for download to watch anywhere in high definition and standard definition on their favorite devices from select digital retailers. *Digital HD with UltraViolet allows fans to watch a digital version of their movie or TV show anywhere, on their favorite devices. Digital HD with UltraViolet is included with the purchase of specially marked Blu-ray discs. Digital HD with UltraViolet allows consumers to instantly stream and download movies and TV shows to TVs, computers, tablets and smartphones through UltraViolet retail services like CinemaNow, Flixster, Target Ticket, VUDU and more. For more information on compatible devices go towb.com/ultravioletdevices. Consult an UltraViolet Retailer for details and requirements and for a list of HD-compatible devices.